WASHINGTON — A vent pipe was found disconnected in the meter room where federal investigators believe the natural gas explosion that killed seven people last summer originated. Although the cause of the Aug. 1, 2016 Silver Spring explosion remains undetermined, a Bureau of Alcohol Tobacco Firearms and Explosives report states that the origin of the blast was a basement room that housed a water heater and gas meters in one of the Flower Branch Apartments buildings. 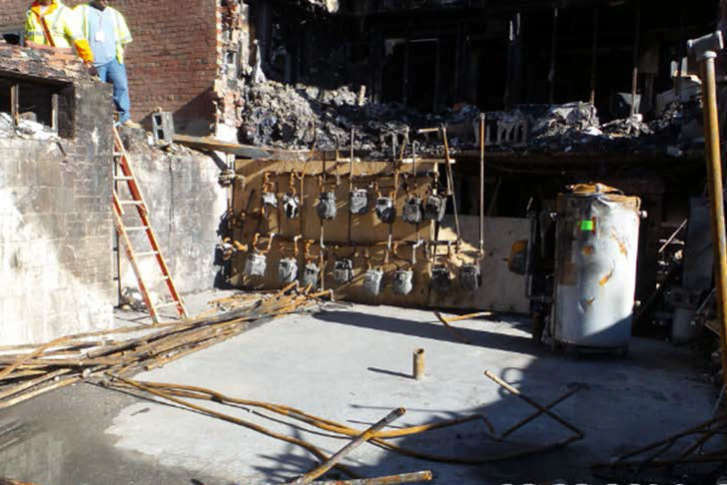 Inside that meter room, investigators found a three-part union vent pipe that had been disconnected before the blast. Investigators said the purpose of the pipe was to release gas outside the building in the event a gas regulator failed. But because the pipe was disconnected, if the regulator had failed, gas would have leaked into the meter room and could have been ignited by the flame on the hot water heater. In the report, investigators say they are certain that the disaster was caused by an explosion followed by a fire, not the other way around. And the report says that all the blast evidence indicates that that the explosion started in the meter room. Additional evidence was found in apartment 101, directly above the meter room. The dead-bolted front door was blown off and the door was found across the street and in a parking lot 300 feet away. It was among the objects blown farthest from the building. The interior bottom of the door was shaded and scorched, consistent with flash fire damage, according to the report. Some of the hardware and equipment in the meter room was so badly damaged — even melted — that investigators couldn’t determine whether any equipment malfunctioned or could have leaked natural gas. They also don’t know who disconnected the vent pipe or why. The investigation led by the National Transportation Safety Board continues. The report was originally provided to the NTSB last fall and portions were released this month.